A schematic section of the greenhouse showing the concept behind the NVAC greenhouse design. The added roof on the inside combined with a misting system use natural ventilation to provide cooling and air movement throughout the greenhouse with cool air movement at the plant level. High greenhouse temperatures can be a problem in regions with hot climates. Recently, developments in protected agriculture practices for tropical and arid climates have allowed some nations to expand their food production. However, many existing greenhouse operations lack proper adaptation to their respective environments. To address this issue, Lucas McCartney and Dr. Mark Lefsrud from McGill University’s Department of Bioresource Engineering in Quebec, Canada, have developed and patented a new greenhouse cooling system specifically designed for hot and/or humid climates. “Our technology is an improved natural ventilation greenhouse based on structurally supported airflow and evaporative cooling-dependent temperature and humidity control,” McCartney says. “The NVAC greenhouse relies on an alternative roof and misting system design to provide cooling and air movement. The misting line functions at relatively low pressures and uses water sourced through rainwater harvesting. This cooling effect in the NVAC greenhouse is accomplished without the need for active ventilation solutions such as the use of fans or cooling pads. The NVAC greenhouse design can be constructed as a stand-alone structure, or it can be retrofitted to the walls and roof of an existing greenhouse structure. In both cases, the combination of the roof structure and the misting system create a cooling air flow without involving additional equipment. The design is applicable year-round in hot climate regions, or during warm months of temperate and continental climates. In numerous regions, including tropical areas such as the Caribbean, passive ventilation and cooling measures are recommended over active methods as they are simple and economically viable. The NVAC greenhouse design remains accessible to growers in all regions due to its low cost, ease of access, and low energy use. • The alternative-design misting system cools the air and provides air movement. • Humidity remains within optimal range; water droplets never reach the crop. • Increased yields and access to crop varieties otherwise not suited for hot climates. • Ease of use, installation, and maintenance with minimal energy needs. • Can be used with existing greenhouse structures through retrofitting. Since 2012, the technology has been rigorously tested and developed in several prototypes in both temperate and tropical climates. Currently, McCartney and Lefsrud are actively seeking collaboration to commercially develop the NVAC greenhouse design. 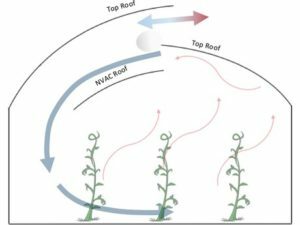 In the eventuality of a collaboration, McGill offers a license to a greenhouse cooling and air movement system, which is inherent to the roof structure of the greenhouse itself. It is an improvement to currently used natural ventilation and evaporative cooling systems. While originally conceptualized for tropical regions, this cooling and ventilation system offers benefits for greenhouses in tropical, arid, continental, and temperate climates. For more information, go to Nvactropicalgreenhouse.weebly.com. I am an agricultural engineer and hav a 800 ha farm in north of Sudan at 18:30N,32:35E. Iam growing vegetables and interested in your new techynologies in structure and ventilation of nethouse. How can I benifit of your techolohies. Please note that there is very high potentials to merchandise your innovation as final product system or we can work together to build and sellm it all over Sudan and other African tropicval and sub tropical areas. It looks like an interesting system but it upsets be that researchers who have received public (taxpayers) money to devise and test a system that could help people in the developing world achieve food security look to cash in on their development by patents and licenses, Essentially making it available to bigger business and creating a barrier to adoption by the smaller, poorer growers who would most benefit from the tech. I am in India and have been involved in horticulture. The biggest issue with India is its varied climate and on top of it it’s a price sensitive place. May be due to price barrier or something, there is little innovation in greenhouse design and [poor farmers are being taken for a ride by the greenhouse suppliers. We need an affordable technology for greenhouse’ cooling. The process are low but volumes are quite high so it will make business sense to introduce technology that is affordable and elongate the production time for greenhouse owners. I would be pleased if this technology is tested in India and made available to farmers. if you have reasonable expectations then it won’t be a problem to sell this concept in India or anywhere provided, of course, that it succeeds in cooling down the greenhouse air. Good Luck to the team!